A bright day but with no wind thank goodness, by this afternoon the sky was a piercing blue and the fishing conditions not at their best. I have not had any meaningful scores in yet as our guests are making the most of another warm’ish end to the day to enjoy the river in the evening light. Tom at Kitza said that Julian P had 12 salmon, others had done less well but were still out. The same with Middle, I know of two fishers who have 25 salmon between them today, but I gather the fishing was a bit patchy and many found the afternoon lean. At Pana Aaron mentioned that they had to work hard today, they had just over 30 by 6 p.m. Here at Lower the team who came over from Kitza got off to a good start, after dinner last night Arnaud FM landed five to give us a great show of how it should be done, including two from Paris Pool right outside the lodge. 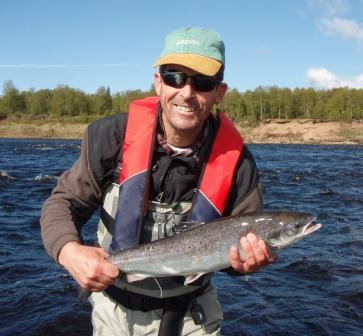 The afternoon was tougher here too, with a very bright sun right into the salmons eyes, despite that I think we will be around 5 salmon per rod. The river has hardly dropped in the last 24 hours and remains at a perfect fishing height, the rain storms a few days ago seem to have kept it topped up. Despite the sun the water temperature remains a constant 10°C. If you are coming out this Saturday – Intermediate tips on floating lines are favoured by most fishers at the moment, the full floater with a slightly heavier fly also works well. The best flies are still around 1” or more. The mosquitoes are early this year, not a nuisance at this stage but it is best to bring repellent just in case. But it could all change so come prepared - we are a long way North, it snowed at Pana on 8 June last year!